Home » What is i2S? Integration and Implementation Sciences (i2S): Improving research impact on complex real-world problems. the framework for a new discipline. 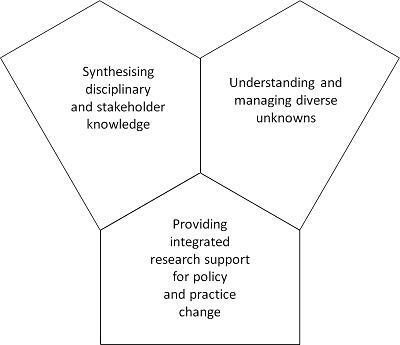 Provision of integrated research support for policy and practice change. education at a range of levels. Bammer, G. (2013). Disciplining Interdisciplinarity: Integration and Implementation Sciences for Researching Complex Real-World Problems, ANU Press: Canberra, Australia. This book includes 24 commentaries and is available free online. i2S framework with the three domains and five questions. The i2S swirl symbolises the synergies among disparate ways of tackling complex societal and environmental problems. The i2S word cloud contains the names of various approaches to tackling complex societal and environmental problems. The aim of i2S is to provide a conduit connecting these approaches, as a common underlying discipline which promotes cross-fertilisation. The i2S repository of concepts, methods and case studies draws on resources developed by all of these approaches. i2S also aims to support these approaches by developing new and improved tools and cases. It is also important to note that there are many researchers seeking to improve understanding of, and action on, complex real-world problems who do not identify with any of the approaches listed in the word cloud. They may be known as T-shaped researchers or knowledge brokers. They are an additional, important group that i2S seeks to connect with. The sculpture Kulla's Ripple by Tim Spellman provides a useful metaphor for several key dimensions of i2S. The ANU Sculpture on Campus brochure (which no longer exists), described the sculpture as follows: "The spherical and concave shapes link the two parts of the installation with their suggestion of symbiotic pairs: positive and negative, solid and void, the mould and the moulded. Spellman describes his work as the attempt to create wholeness from the dualities of past and present, the physical and the spiritual." Unlike the sculpture where both elements of the pair are reasonably equal, the symbiotic pairs relevant to i2S are not, with the right-hand element in each pair (intractable problems, systemic research approaches and dealing with unknowns) relatively underdeveloped. Indeed the rationale for i2S is to: a) improve the research community's ability (and therefore the ability of society in general) to deal with intractable problems; b) strengthen systemic research approaches; and, c) advance understanding and management of the unknown. Whereas the ability of research to deal with tractable problems using reductionist methods is highly developed and sophisticated, the ability of research to deal with intractable complex problems using systems-based methods is still relatively ill-formed and unwieldy. i2S aims to even out the relationship by enhancing the ability of research to deal with intractable problems. The sculpture is located on ANU Campus on Chifley Meadow, near the Menzies Library. These domains depict the three key elements of i2S. They also highlight the importance of formulating policy and practice change taking into account unknowns and not solely relying on existing evidence. 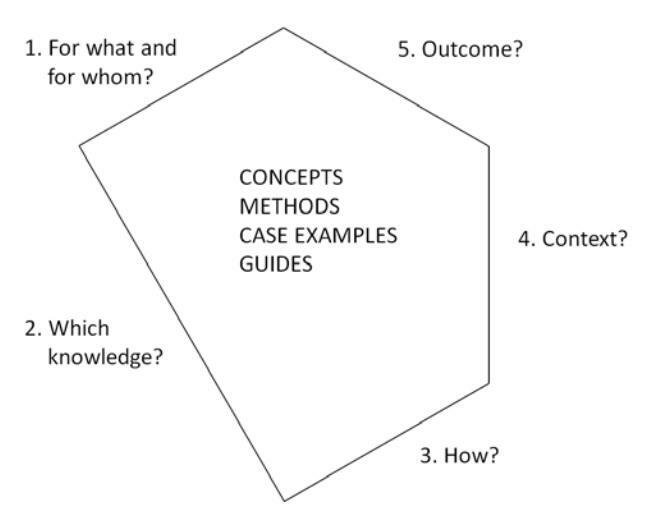 The full i2S framework builds on the three domains image, by labelling each side of the pentagons with the key elements of the five questions which are also an integral part of the framework. materials from the 2013 First i2S Conference.